Tom Franklin is the New York Times bestselling author of Crooked Letter, Crooked Letter, which won the Los Angeles Times Book Prize and the Crime Writers' Association's Gold Dagger Award. His previous works include Poachers, Hell at the Breech, and Smonk. He teaches in the University of Mississippi's MFA program. The epigraph reveals the origins of the novel's title. Why do you think Tom Franklin chose to use "Crooked Letter, Crooked Letter"? What significance does it hold for the story? Describe the boys Larry and Silas were, and the men they became. What drew Larry and Silas together as children? What separated them? How did you feel about both characters? What elements of Larry's life set him apart from others? Could he have done anything to change people's opinion of him? Would you call Larry a "loser'? What about Silas? When Larry is shot at the beginning of the novel, he is sympathetic to his attacker. "Larry felt forgiveness for him because all monsters were misunderstood." Does Larry consider himself to be a monster? Why? Why isn't he bitter? Could you be as charitable if you were in his place? Why does he say all monsters are misunderstood? Do you think he feels the same way at the end of the novel? During the attack, the shooter is wearing an old monster mask that Larry recognized. What did that mask symbolize for both the victim and his attacker? Tom Franklin goes back and forth between past and present to tell his story. How are Larry and Silas prisoners of their childhoods? How can we break the past's hold on us? Describe Larry's relationship with his father, Carl. How might things have been different if Larry knew the truth about his family sooner? Why did Carl force Larry and Silas to fight as boys? What impact did that fight have on their friendship? Do you think the outcome was Carl's intent? How did Silas feel about Carl? Talk about both boys' relationships to their mothers. How did their mothers shape them? Were they good sons? What kind of people were their mothers? Why does Silas go to see Larry's mother in the nursing home? When Silas visits Mrs. Ott, he's reminded of the past when he first arrived in the town with his mother, both of them coatless in the cold. "Sometimes he thought how Larry's mother had given them coats but not a ride in her car. How what seemed liked kindness could be the opposite." How was this behavior cruel? Can you think of other examples from the book where kindness and cruelty were combined? Was Larry treated fairly by the community or the law? We're supposed to be a nation of laws in which people are innocent until proven guilty. Why did Silas remain silent when he could have helped Larry when they were teenagers? Why does he finally come forward with the truth? How might both their lives have been different if the truth were known? When he was a little boy, Larry's mother used to pray for God to send him a special friend, "one just for him." Were her prayers answered? After Silas, Larry considered Wallace Stringfellow to be his friend. What was the bond between Larry and Wallace? What attracted one to the other? Were they really friends? What is a friend? As an adult, Larry also prayed to God. "Please forgive my sins, and send me some business. Give Momma a good day tomorrow or take her if it's time. And help Wallace, God. Please." What were Larry's sins? Why did he pray for Wallace? What did Larry see in Wallace? When Larry is in the hospital after the shooting, Silas goes to visit. "He wondered how broken Larry was by the events of his life, how damaged." How would you answer Silas? Was Larry broken? Was he damaged? What kept him from becoming the monster everyone believed he was? Silas, too, wonders about himself. "What's missing out of you Silas?" Does he discover his missing self? How? Is Silas a better man for the knowledge? How does that insight affect Larry's life? Larry felt he was to blame for Wallace's tragic choices. Do you think he was responsible at all? What about Silas? How much responsibility do we carry for others? For family? Friends? Strangers? How much responsibility does the community bear for the Wallace's actions? How does Larry react when Silas tells him the truth about their childhood? Can true friends overcome betrayal? How? Do you think they will be part of each other's lives going forward? Silas left Southern Mississippi then returned. Larry never left. Why did they make the decisions they did? What was it about their small town that drew and kept them there? How does place shape the novel? Could this have happened in any small town? How is racism a part of the story? Use Larry and Silas's experiences to support you response? Crooked Letter, Crooked Letter is also a coming of age story. How did the characters come into themselves as the story progressed? What possibilities might the future hold for Larry and Silas? At the novel's end, Tom Franklin writes, "the land had a way of covering the wrongs of people." What does he mean by this? 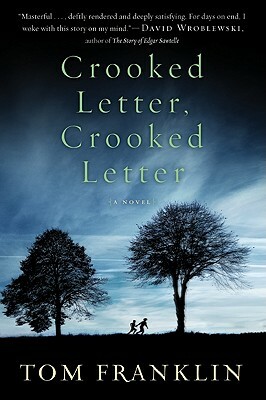 What did you take away from reading Crooked Letter, Crooked Letter?